This is by far my FAVOURITE nail polish line from Sally Hansen. 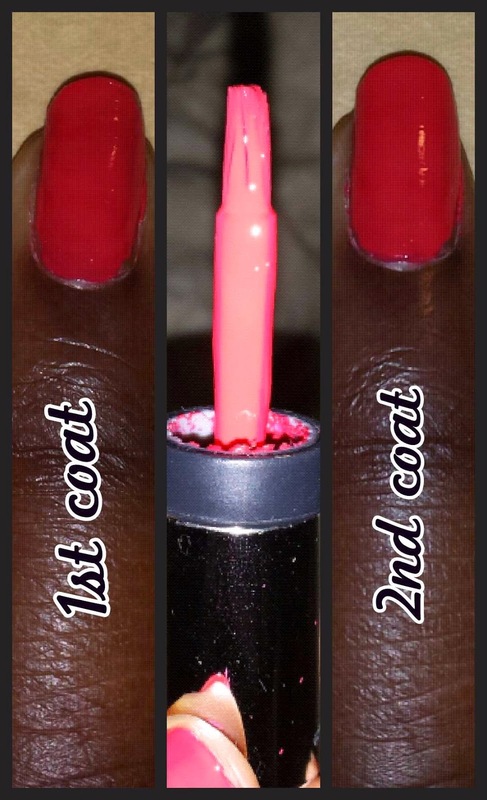 If you have not tried this polish line you definitely need to. With one stroke that offers great coverage with a wide brush, this nail polish line makes painting your nails hassle free. The line promises a manicure in a bottle, a 7 in 1 nail polish. It boasts that it is a base coat, strengthener, growth treatment, has salon-inspired colours, top coat, chip-resistance and offers a gel like finish. All of which I can say it does do. The price varies from $7.99 to $10.99 (CDN/USD) depending where you get it. Tips: Don't paint too close to the cuticle and you will achieve a fantastic 'I went to the salon look'. Pros: Nails feels stronger after using. The finish looks and 'feels' as if you got your nails painted in the salon. I have a wider nail bed, so this brush overs it well and with no streaks! Cons: This is a 7 in 1 polish and it is priced to reflect the product (higher cost considering it is a drugstore brand). But you can always find a sale! The width of the brush is wide, therefore if your nail bed is narrow you will have some trouble using this product. This product will chip like all other nail polishes (I got 4 days wear before my first chip appeared). Final thoughts: This nail polish is great. Easy to use and with such classic to trendy nail colours you are sure to find something that suits you. A must try. Trust me you will LOVE it! I know I do. lovely colour. I like sally hansen just that is always a little bit expensive. I agree it is, but I always try to snag them on a sale. Thanks for stopping by. I will definitely get a few of these colors. Big fan of Sally Hansen and the finish looks great on your finger. Last day to enter my Beauty & Jewelry $400 Giveaway! Thank you for stopping by. Will enter your giveaway!